If you are looking for an inexpensive car for your DIY electric car conversion project, then an older model VW Beetle Bug may be the car for you. You can find them almost anywhere including used car dealerships, motor trading sites, government auction sites and various other places. If you find an old bug with a blown up motor then you should snag it up quickly for a lower price, just don’t let the seller know that you plan on getting rid of it for your EV conversion. An EV VW bug is actually a simply made vehicle after retrofitting. There are no complicated electronic components or circuitry to deal with. In your search for an electric donor car you should look for a car that is rear wheel drive, most VW Beetles are rear wheel drive. A bug is good for EV conversion because they have ample storage in the front. If you take out the spare tire you would have enough room to store at least ten units of deep cycle batteries. To extend your cars mileage you can place more batteries behind the driver’s side seat of your bug. Since a VW Beetle is a common electric donor car you can easily find an EV conversion kit for it. If you purchase this kit you can save a lot of time converting this car to run on electricity. The adapter plate that comes in this kit is already cut to fit so all you have to do is simply line it up and bolt it on. The VW beetle is a light weight car generally weighing in at under 1800 pounds, which is good for an electric car conversion project. Less weight means less power needed to propel the car. Less power used to run the car means extended battery life. This particular cars excellent engineering has made it relatively easy to remove the internal combustion engine or ICE. To remove the engine all you have to do is open the engine cover, place a hoist above the engine, loosen a few bolts and it is done. Some other cars require a ton of manual labor and make removing the engine as hard as pulling a tooth with a set of pliers. If you are using the DIY or doing it yourself method to transform this car into an electric run vehicle then you need to get a car with a manual transmission. Finding an old VW Beetle with a manual transmission saves you a lot of time and money. Since the old Volkswagen Beetle was such a common car you should not have any problems finding inexpensive parts for it. The reasons above are why I believe that an old Volkswagen beetle would be a great donor car for a DIY electric car conversion project. Are you planning to convert a conventional VW Bug into a pure electric car in your home garage? If you are, it is best you read up on the science of EV conversion. 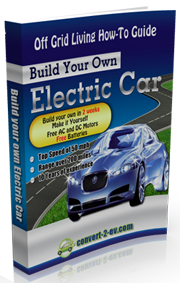 Building your own electric car will give you mental satisfaction as you will be contributing to the environment. The five basics which you require are given below and are quite useful in developing your own electric car. The first thing you need to decide about the type of car or pickup which you would like to convert into electrical car, pick up is a vehicle which less than one ton rated vehicle. All electric vehicles have to carry certain amount of weight which comprises of batteries and an electric motor and also some other component. The number of batteries means more distance between the two charges, that the reason why small pickups are quite suited for such conversions. You can find many small pickups which are available for sale; such pickups have damaged engines which can be easily replaced by an electric motor. This move will help you to save lot of money. Such engines can be removed in just one hour, now you will have to look for an appropriate electric motor which can drive the vehicle.